Soak the cashews and dates in water for at least 1 hour before making the tart. Line a 25cm tart tin with baking paper or coconut oil. When ready to make the crust blend almond meal, coconut, dates, coconut oil and cacao powder in a food processor for a few minutes until the mixture is sticky. Press the crust mixture in the tart tin and use the back of a spoon or your fingers to spread the mixture across the base and up the side of the tin. When ready, place into the freezer. 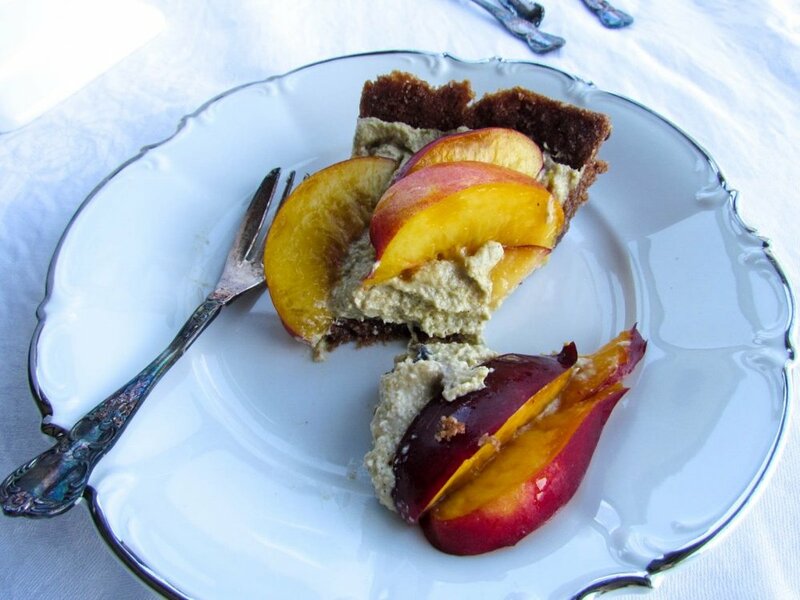 To make the filling blend cashews, nectarines and vanilla bean paste in a food processor until smooth and creamy. Take tart base out of the freezer and pour filling mixture into the middle. When ready to eat decorate the top of the tart with nectarines. This tart will keep in the fridge for up to 5 days and it also stores well in the freezer.